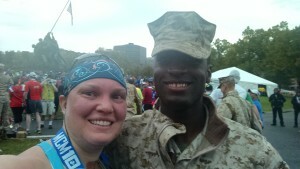 You can check out Mike’s full review of the Marine Corps Marathon here: Part 1 & Part 2. Why I decided to run this race. There’s something about the Marine Corps Marathon that draws a person in. I’m not sure if it’s the history of the race or the city or something else, but I really wanted to be a part of the event. However, I haven’t trained for a marathon and I’m not sure I ever want to run a full 26.2. 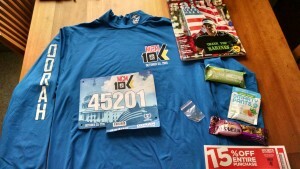 So I was happy to learn about the 10K event that is held in conjunction with the marathon. 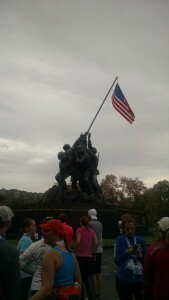 The 10K ends at the same place (the Iwo Jima Memorial) and runs parallel to the marathon course at times. So you get all the hoopla of the MCM but it’s 20 miles shorter. It sounded perfect. Since I’d been training for several half marathons in September and October I was already trained for the 10K distance. Coming off my minor success at the Army 10 Miler, I consulted with my coach and we decided I should use a similar race plan. This would allow me to hopefully have another successful race but without sabotaging my taper going in to the runDisney Wine & Dine and Avengers half marathons, which were coming up just 2 weeks later. There’s always time for an expo selfie, even when you have to rush back to work for a meeting. The race expo was a madhouse. Apparently the MCM expo is always crazy, but I had no idea what to expect. As soon as I walked in the door to the convention center I was faced with a line to get into the line to go downstairs to get through security. Then there was a line to walk to the security line. Since I was there on my lunch break and had to get back for a meeting, I was a little worried that I wouldn’t get my bib in time. But after about 20 minutes I finally entered the expo space to get my bib. The 10K is a smaller race than the marathon so the bib and shirt lines were much shorter. In fact, in both cases I walked up to the counter with no wait. The expo is laid out very well. Attendees were directed to move in a clockwise direction. After we picked up our bibs and shirts we exited into a huge official merchandise section. Official merchandise probably took up a quarter of the expo space and they had a great selection of marathon gear. However, I only saw one 10K item and even if I had wanted it there’s no way I would have stood in the check-out lines, which each appeared to be about 300 people long. The general vendor space had a lot of the same folks I see at a lot of expos and since I needed to rush back to work I didn’t take a lot of time to walk through them. I did stop by Jeff Galloway’s booth hoping to chat with him, but he happened to be across the street giving a talk and wouldn’t be back until after I had to leave. Oh well, I’m sure I’ll see him at Wine & Dine and Avengers. The shirt is a little plain for my tastes, but it will be a nice warm layer this winter. 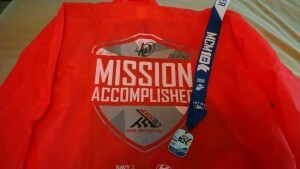 Our swag bags for this race were about on par with those from the Army 10 Miler and the Navy/Air Force half. We each received a unisex long sleeve, heavyweight blue shirt, some snacks from Wegman’s, and a coupon from Sports Authority. The shirt will probably make an appearance in my running wardrobe if we have a cold winter because it’s really thick and will make a great cold-weather layer. But since it’s unisex it’s not something I’ll wear otherwise. The weather for the 10K was supposed to be cool and overcast, but since I get so hot when I run I still opted for a tank and running skirt. As we rode the metro to the race that morning I got some looks because it seemed that I was underdressed for the weather, but during the race I was the perfect temperature so I made the right decision for me. What I wore: zebra-print Sparkle Skirt with built-in shorts, Snow Queen Raw Threads racer tank top, white Adidas sports bra, Red Hair Swirls Raw Threads headband, Injinji socks, Brooks Adrenaline ASR 12 shoes, Garmin Forerunner 620 and Gymboss interval timer, Louva arm sleeves, and Amphipod hydration belt. Despite the fact that my two favorite weather sources promised that the rain would stop by sunrise and we shouldn’t have to deal with it at the start of the race, the second we arrived at the start line and stepped into the port-a-potty line, it started raining on us. It was a light sprinkle and wasn’t actually too bad, but it did make the streets a little slick and for someone terrified of falling and re-injuring her ankle it did make me tentative in my footsteps. Race Icon: the amazing finish at the Iwo Jim Memorial. Speaking of the port-a-potty lines…that’s the only thing my husband and I saw during the pre-race. We were in line for more than 20 minutes: we listened to the National Anthem and we heard the gun to release the runners all while standing there. On the bright side, because I went potty before I started my race I didn’t need to stop during the race. Plus, even though we missed the official start, by the time we wormed our way into the corral and started moving I ended up being seeded exactly where I needed to be. I was a bit surprised that we had a mass start for such a large race and it took me 3:30 to cross the starting line after the clock started, but I thought it worked out OK because the streets were pretty wide and it seemed that we were all able to find enough room to fall into own paces right away. Have I mentioned how I love running through DC? If not: I love running through DC! This course was actually very similar to the Army 10 Miler, just in a different order. We started near the National Mall, crossed the 14th Street bridge into Crystal City, looped around and headed out past the Pentagon, and ended at the Iwo Jima Memorial in Rosslyn, Virginia. There were some subtle ups and downs, but in general the terrain wasn’t that challenging, except for the hill right before the finish line (seriously? right before the finish???). For more course details, you can check out Mike’s full review of the 2014 Marine Corps Marathon here: Part 1 & Part 2. The SMO and the post-race jacket; I heard they ran out of the jackets for the folks at the back of the marathon pack, but I was happy to get one. The marathon medal is obviously the stunning one, but I liked our 10K medals. They were shaped like dog tags and were presented by a Marine. It’s a simple design, but meaningful. I like it. The one thing worth pointing out about getting the SMOs is that it turns into a huge back-up. There were lots of Marines handing out medals. But unlike most races where you just grab your medal and go, at this race most people were waiting for the Marine to put the medal over their heads and then taking a selfie with them. I can’t get mad at anyone for doing this—I did it, too—but it does cause a huge traffic jam. I met up with my husband right after I navigated the medal gauntlet; we took a quick selfie of ourselves with the Iwo Jima Memorial in the background and then jumped into the snack line. There were a lot of people moving through this area and a lot of stuff to grab (bags, Gatorade, snack boxes, bananas, water, trash stop, jacket) and I thought they had a pretty good flow to It. It seemed to me that it logically moved the people through all the stops and put us on our way to the post-race party. My husband disagreed. The great thing about doing the 10K rather than the marathon is that even though I was in the mid-to-back of the pack, the lines were still relatively short when we got to the party because all of the marathoners were still on the course. We walked right up to the beer table to get our free beers and stood in a sparsely populated beer garden drinking and eating our snacks. (Note to self: animal crackers do not pair well with light beer.) The party itself takes up several blocks in Rosslyn, Virginia, and had a finisher’s merchandise tent, various vendors with free samples, music, and other fun stuff to do. We wandered through the party but headed to the metro pretty quickly because I had to get home and do another 7 miles for a training run. Since I use the same playlist on shuffle, I did have a few repeats from other recent races. However my iPod seemed to favor cartoons, puppets, and Katy Perry this time. As I crossed the starting line, an acoustic version of “Everything is Awesome” from the Lego Movie started playing. How can you have a bad race when you start off being reminded how awesome life is? Later my iPod served up a pair of really random but funny songs that may have caused me to laugh out loud for seemingly no reason and I may have gotten some weird looks from my fellow runners: Batman’s song (“Untitled Self Portrait”) from the Lego Movie, and “Schadenfreude” from the musical Avenue Q.
I had fun at this race and I could see myself doing it again in the future. I’m not sure I would do it and the Army 10 Miler again the same year, just because the courses are so similar. But it’s a good race and worth considering if you’re not quite ready to take on 26.2. 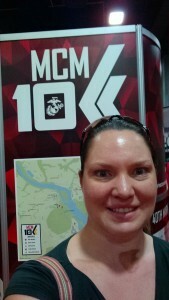 You can check out Mike’s full review of the 2014 Marine Corps Marathon here: Part 1 & Part 2. The Casual Runner Team wants to hear from you. If you have any questions about anything we cover here on Casual Runner, if you have any questions regarding running gear or training for your own Casual Running needs, or if there is anything that you would like us to cover on Casual Runner, please leave a comment or email us using the links below. To ensure that you do not miss all of the great content from Casual Runner, please be sure to like us on Facebook, follow us on Twitter, Pinterest, and Instagram, subscribe to our YouTube channel, and add us to your circle on Google+. Enjoy the freedom of going wherever your feet, imagination, and determination will take you!